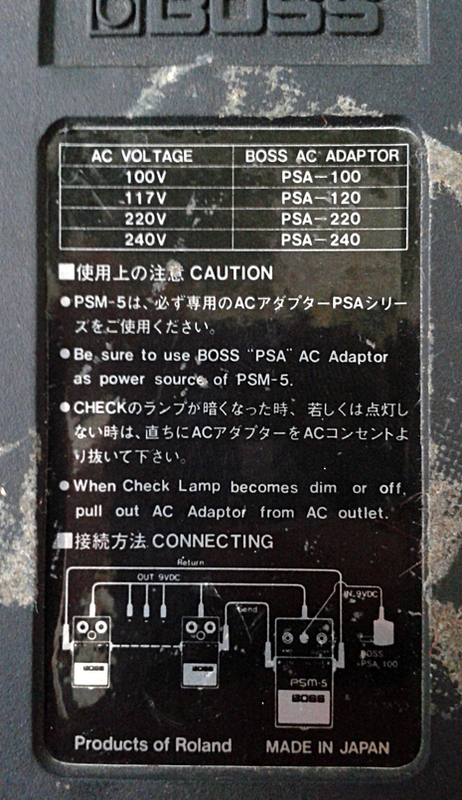 Boss PSM-5 Power Supplu & Master Switch. Made in japan, november 1982. There has been a time place for everything. Daisy chaining, or dedicated power supplies were both practically unheard of until this new and exciting device hit the market. 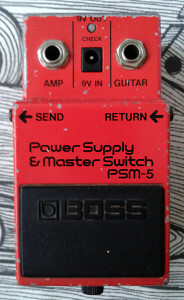 What surprises me more is that the pedal was actively sold from 1983 all the way until 1999. I thought the interest for the features offered would have been way gone by 1999. This unit has seen use and it has the orginal black label on its bottom. The label explains the main features as well. 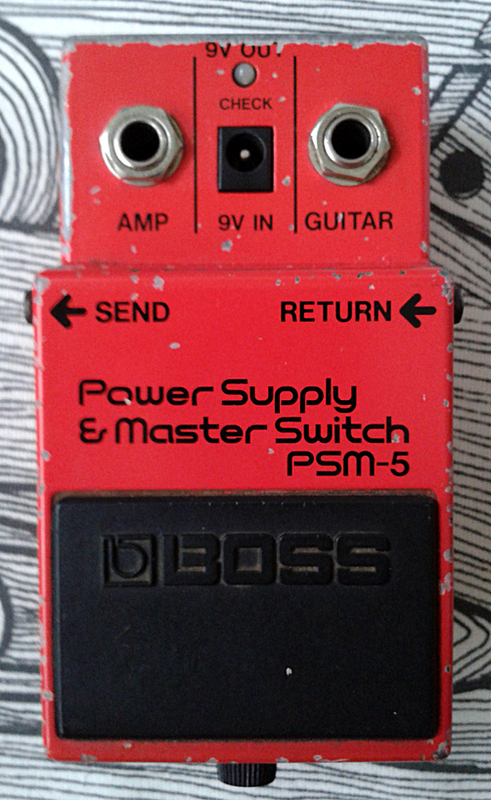 The nice looking old school style board houses the boss standard flip-flop switching and an effect loop (’cause that’s what the pedal actually does). 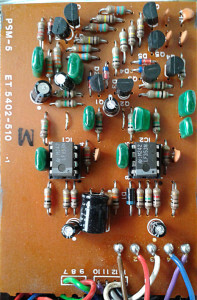 These were originally shipped with a power supply and a splitter cable for up to seven effects. Since my specimen is from the year 1982, you can take a guess if either of those have survived. Quick search produced a schematic, which confirms that the design for the loop is simply four buffers, controlled by electronic switching – an effect loop if you will. Schamatic also shows that the power supply is only splitted for the out going 9VDC. One other thing noted in the schematic. 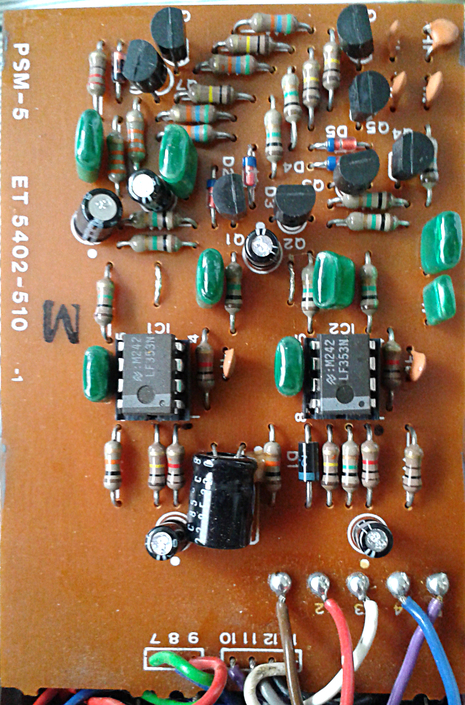 The operational amplifiers should be NJM4558DD, or in other words the classic JRC4558D. Seeme like mine has been modded at some point in the pedal’s life. The ICs have been removed and replaced by sockets, which now have two LF353s, high grade audio chips in them. Rest of the semiconductors seen on the board are two BJTs for the flip-flop, another two BJTs for LED control and four JFETs to take care of the actual switching of the loop. 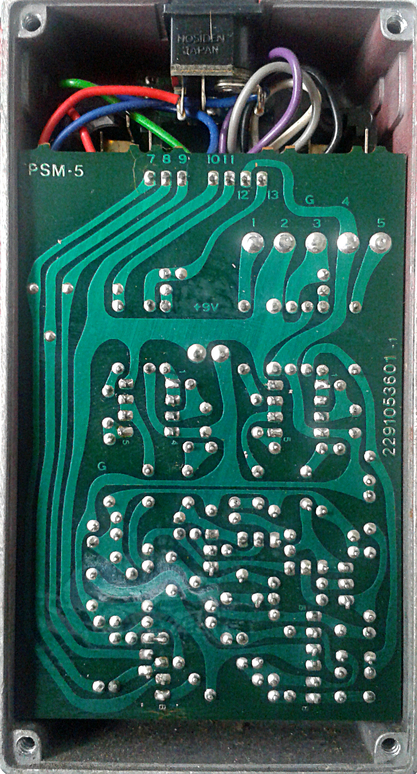 These older Boss boards are mostly a pleasure to look at. Acid trip traces but annoying lack of symmetry. Plus an acre of free land to grow your tomatoes. It works as an effects loop, so it should not have a sound of its own. And furthermore, it doesn’t. I do understand why someone wanted to swap the opamps for “better” ones, but as they are acting only as an unity amplifiers (or we could say buffers), i strongly feel the improvement in sound is next to nothing. This being there’s not much i can say about how it sounds. 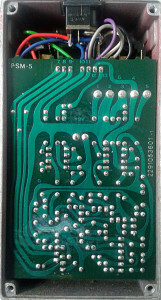 It is a relic, which makes it rather interesting. I do believe this had lots and lots of user value back in eighties and in the beginning of 90s. Using one now? Not a chance. There are tiny hardwired true bypass loopers and extremely high quality standalone buffers in existence, so at least for me, the choice would be very simple and clear. Entries (RSS) and Comments (RSS). 32 queries in 0.100 seconds.